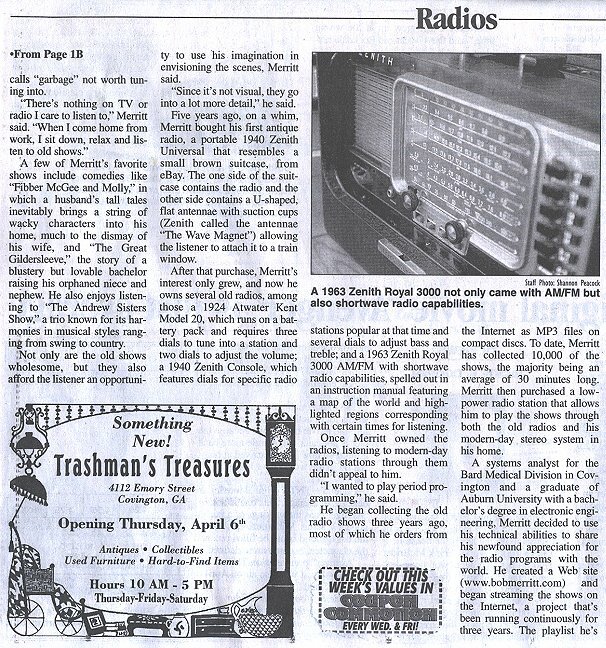 Conyers Old Time Radio was in the News!! Wednesday April 5th, 2006. It is reprinted here with permission. instead, it's my 1955 Zenith Trans-Oceanic Model R600 AM/SW Portable Receiver. 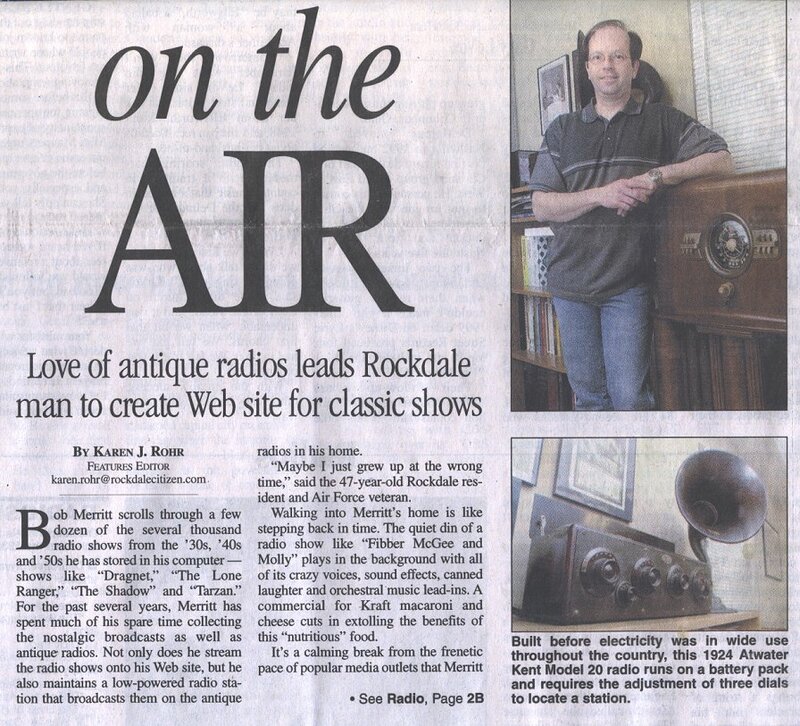 Love of antique radios leads Rockdale man to create Web site for classic shows. Bob Merritt scrolls through a few dozen of the several thousand radio shows from the �s, �s and �s he has stored in his computer � shows like 揇ragnet,� 揟he Lone Ranger,� 揟he Shadow� and 揟arzan.� For the past several years, Merritt has spent much of his spare time collecting the nostalgic broadcasts as well as antique radios. Not only does he stream the radio shows onto his Web site, but he also maintains a low-powered radio station that broadcasts them on the antique radios in his home. 揗aybe I just grew up at the wrong time,� said the 47-year-old Rockdale resident and Air Force veteran. Walking into Merritt抯 home is like stepping back in time. The quiet din of a radio show like 揊ibber McGee and Molly� plays in the background with all of its crazy voices, sound effects, canned laughter and orchestral music lead-ins. A commercial for Kraft macaroni and cheese cuts in extolling the benefits of this 搉utritious� food. It抯 a calming break from the frenetic pace of popular media outlets that Merritt calls 揼arbage� not worth tuning into. A few of Merritt抯 favorite shows include comedies like 揊ibber McGee and Molly,� in which a husband抯 tall tales inevitably brings a string of wacky characters into his home, much to the dismay of his wife, and 揟he Great Gildersleeve,� the story of a blustery but lovable bachelor raising his orphaned niece and nephew. He also enjoys listening to 揟he Andrew Sisters Show,� a trio known for its harmonies in musical styles ranging from swing to country. Not only are the old shows wholesome, but they also afford the listener an opportunity to use his imagination in envisioning the scenes, Merritt said. 揝ince it抯 not visual, they go into a lot more detail,� he said. 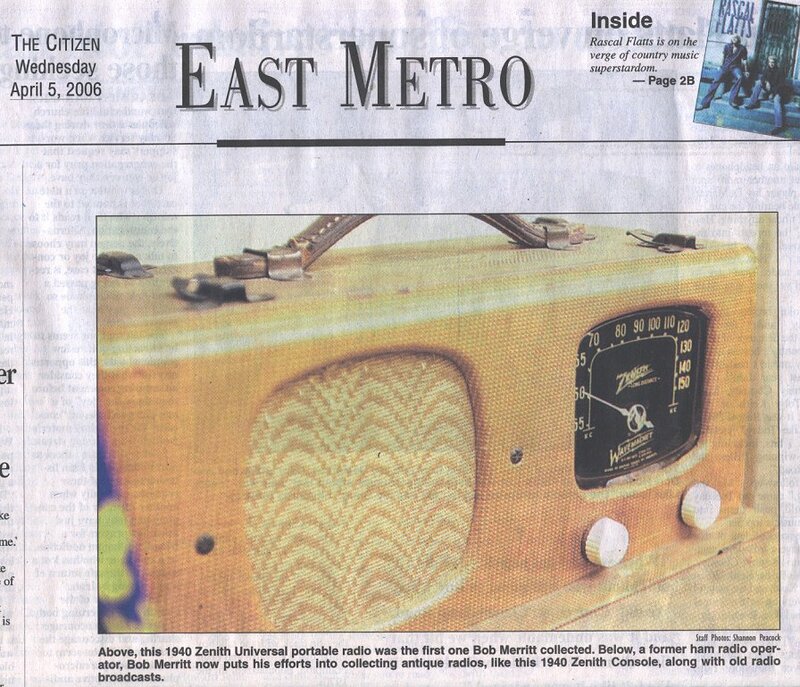 Five years ago, on a whim, Merritt bought his first antique radio, a portable 1940 Zenith Universal that resembles a small brown suitcase, from eBay. The one side of the suitcase contains the radio and the other side contains a U-shaped, flat antennae with suction cups (Zenith called the antennae 揟he Wave Magnet�) allowing the listener to attach it to a train window. After that purchase, Merritt抯 interest only grew, and now he owns several old radios, among those a 1924 Atwater Kent Model 20, which runs on a battery pack and requires three dials to tune into a station and two dials to adjust the volume; a 1940 Zenith Console, which features dials for specific radio stations popular at that time and several dials to adjust bass and treble; and a 1963 Zenith Royal 3000 AM/FM with shortwave radio capabilities, spelled out in an instruction manual featuring a map of the world and highlighted regions corresponding with certain times for listening. Once Merritt owned the radios, listening to modern-day radio stations through them didn抰 appeal to him. 揑 wanted to play period programming,� he said. He began collecting the old radio shows three years ago, most of which he orders from the Internet as MP3 files on compact discs. To date, Merritt has collected 10,000 of the shows, the majority being an average of 30 minutes long. Merritt then purchased a low-power radio station that allows him to play the shows through both the old radios and his modern-day stereo system in his home. A systems analyst for the Bard Medical Division in Covington and a graduate of Auburn University with a bachelor抯 degree in electronic engineering, Merritt decided to use his technical abilities to share his newfound appreciation for the radio programs with the world. He created a Web site (www.bobmerritt.com) and began streaming the shows on the Internet, a project that抯 been running continuously for three years. The playlist he抯 streaming contains about 6,000 shows that will run for 90 days without a repeat. He prepares special broadcasts for Christmas and D-Day, for which he plays 36 hours of programming from the day the U.S. invaded Nazi-occupied Europe during WWII. Merritt pays for enough bandwidth to allow 32 listeners (the listeners tune in an average of 28 hours straight) onto the Web site at one time. He mostly gets senior citizens and the visually impaired tuning in. But they listen from across the United States, and he抯 discovered links to his Internet radio station on European Web sites. 揑t抯 something different. Not everybody is doing it,� Merritt said. The following is a sampling of Merritt's radio show collection from the 1930s through the '50s found on his Web site.